USA Today helps shine a spotlight on Usher syndrome in Mediaplanet's Vision and Hearing Health supplement. The Usher Syndrome Coalition recently participated in Mediaplanet's Vision & Hearing campaign where we joined forces with industry leaders and advocates to raise awareness of the millions of Americans currently living with some form of vision or hearing impairment. The campaign was distributed through USA Today March 13-15, 2015 and is published online. To view the digital campaign featuring Usher syndrome, click the links below. Usher Syndrome Coalition Chairman, Mark Dunning, provides an overview of this rare inherited disorder. 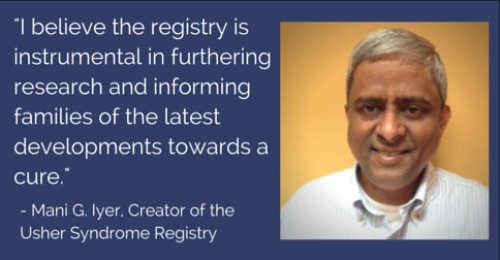 Mediaplanet interviews Mani Iyer about coping with deafness and blindness, taking advantage of available resources, and his significant impact on our community through the creation of the Coalition's international Usher Syndrome Registry.